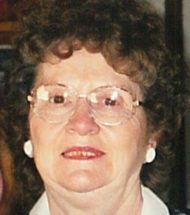 Mary E. Zepp, 89, of Lancaster passed away Tuesday, January 15, 2019 at Hamilton Arms Center. Born in Lancaster, she was the daughter of the late William and Mary (Elmer) Garman. She was the wife of the late Roy H. Zepp Jr. who passed away in 2007. She enjoyed crocheting, knitting, going to church and spending time with her beloved pets. Most of all Mary enjoyed providing for her family. Mary is survived by her son, Donald I. Zepp, husband of Michelle of Lititz and daughter, Alice A. Lare of Columbia. Also surviving are five grandchildren and two great-grandchildren. She was preceded in death by her daughter, a son and her sister. Funeral Services for Mary will be held at 11AM on Monday, January 21, 2019 at the Charles F. Snyder Funeral Home & Crematory, 414 E. King St, Lancaster, PA 17602. Interment will follow in Riverview Burial Park. Family and friends will be received from 10-11AM at the funeral home on Monday. In lieu of flowers, contributions can be made to Compassus Hospice, 2101 Oregon Pike, Suite 301, Lancaster, PA 17601.